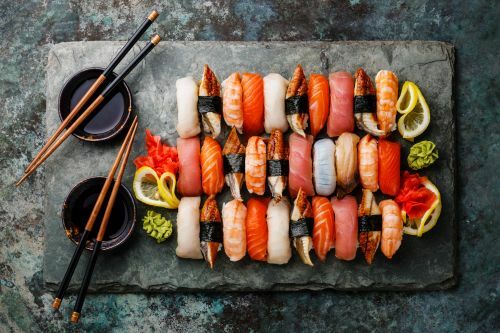 Menulog delivers for Kokoro Japanese Sushi so you'll be able to track your courier on a map. Salmon, tuna, kingfish and prawn. Six pieces of salmon nigiri, top side partially flame grilled with teriyaki sauce. Tempura prawn and cucumber wrapped in nori, coated with avocado and sweet chilli mayonnaise sauce. Crab meat, cucumber and mayonnaise wrapped in nori and coated with salmon, tuna, kingfish and avocado. Prawn and avocado wrapped in nori, coated with salmon and mayonnaise sauce. Crab meat, cucumber and avocado wrapped in nori, coated with salmon, roe, spring onion and mayonnaise sauce. Roasted duck breast with mango, avocado in nori, coated with egg wrapper, mayonnaise and teriyaki sauce. Soybean paste soup with tofu, nori and spring onion. Japanese style potato cake. Served with tonkatsu and mayonnaise sauce. Steamed soybeans with salt or stir fried with salt and pepper. Shrimp and vegetable Japanese style pancake. Three pieces of deep fried tofu. Served with soy sauce. Five pieces of pan seared chicken and vegetable dumplings. Six pieces of deep fried octopus balls. Served with tonkatsu and mayonnaise sauce. Four pieces of deep fried battered prawns. Served with light soy sauce. Japanese style tofu with salad. Four pieces of deep fried battered prawns with soy sauce. Salmon, tuna and kingfish with salad. Pork loin, crumbed and deep fried with tonkatsu sauce. Grilled salmon cutlet with teriyaki sauce. Roasted duck breast with teriyaki sauce. Vegetable in teriyaki sauce. Served with salad, vegetable croquette and rice. Grilled in teriyaki sauce. Served with gyoza, salad and rice. Fried breadcrumbed chicken or pork. Served with gyoza, salad and rice. Grilled eel in teriyaki sauce. Served with gyoza, salad and rice. Grilled chicken or beef with Japanese curry sauce. Served with gyoza, salad and rice. Fried breadcrumbed chicken or pork in Japanese curry sauce. Served with gyoza, salad and rice. Teriyaki served with gyoza, salad and rice. Eight pieces of nigiri sushi, six pieces of sashimi. Served with seaweed salad. Grilled beef and vegetable with teriyaki sauce. Chicken and vegetable cooked with sweet chilli soy sauce. Beef and vegetable simmered with yam noodle in a soy dashi broth. Fried rice with egg, chicken, pork, shrimp and vegetable in a soy sauce. Pork loin, crumbed and deep fried, vegetable cooked with curry sauce. Chicken fillet, crumbed and deep fried, vegetable and egg simmered in soy dashi stock. Grilled eel fillet with teriyaki sauce. Crumbed pork or chicken with noodle in curry sauce. Crumbed prawn with noodle in curry sauce. Grilled chicken in a teriyaki sauce over noodles in a miso soup base. Chicken fillet, crumbed and deep fried. Four pieces of deep fried battered prawns over noodle in a dashi broth. Two pieces of tempura prawns and grilled chicken. Green tea, strawberry and custard. Two crispy chicken hand rolls. Two teriyaki chicken with avocado hand rolls. Two vegetarian with carrot, tofu skin, avocado and cucumber hand rolls. Two fresh salmon with avocado hand rolls. Two teriyaki salmon with avocado hand rolls. Two cooked tuna with avocado hand rolls. Two fresh tuna and avocado hand rolls. Two prawn salad and avocado hand rolls. Two spicy cooked tuna with cucumber hand rolls. Two tempura calamari hand rolls. Two tempura prawn hand rolls.